A quick recap for those who may not know: the Sony PlayStation only came about because a deal between Sony and Nintendo to produce a CD-based console fell through. 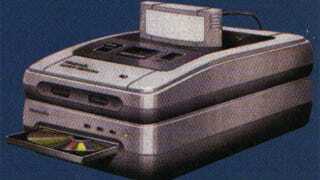 Nintendo then went ahead with plans to make their own CD drive, and stick it on the SNES. That ill-fated attachment never appeared on the market, but enough progress was made that some technical docs for the product are still out there in the wild. The first PlayStation 1 controllers looked silly. No wonder the world never got to use them. GREE's Steve Lin, who is also a mean retro games fanatic, has been posting all kinds of old and rare Nintendo stuff on his Twitter feed lately. Much of it you will have seen on Total Recall before, but these SNES CD-ROM documents are brand new, and are one hell of a thing to see after all these years. There's not much here yet. Just three pages. But one of those has specs, which should be of interest. The layout to get it all working seems a little nuts, too. That's a lot of bolting and tying together. Sega did something similar with its own CD drive, and it was a mess. He's saying that the entire document will be part of a public archive soon. Can't wait. UPDATE - Well, whaddya know. Someone else who had the entire document has kindly passed it along to Kotaku. Thanks! There's some good stuff in there, like the fact the plastic casing around the CDs wasn't just to protect them, but to serve - like it did with the Famicom disk system - as a crude form of copy protection. You can check the whole thing out below! Note that if Google's pdf viewer is making things difficult, you can view each page individually by right-clicking on it and opening the image in a new tab. Total Recall is a look back at the history of video games through their characters, franchises, developers and trends. You can find more stories like this one here.